It was a busy day at the CCFC. NM Oliver Chernin won all three games and took quad one by a 1.5 point margin! Dennis Li posted the second perfect score of the day, winning quad two. Dylan Young had a fantastic tournament, also winning all of his games to pick up more than 100 points! The only tie of the day was in quad four. Thomas Ewald and Matthew Liew shared first place with 2/3 each. 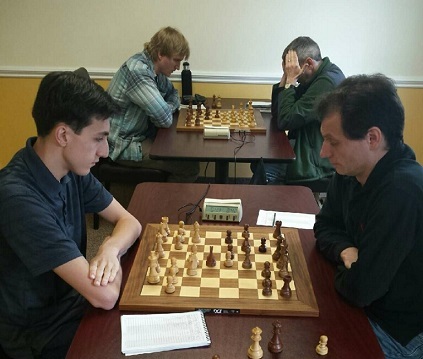 Thomas Ewald Sr. triumphed over a very youthful bunch, winning quad five with a perfect score!